We don't have one for our captain either! FFS Josh windass had a song! My effort for our captain to the same tune as the VVD song the Liverpool fans sing. Even getting the kids versions going now. Class. Some questions for those who would be interested in this. Would it have to be Glasgow, would a wee town, say Largs as an example be better? Just trying to work out how best to do it. Not even sure what numbers to aim for. That is real forward thinking stuff going on there. Those kids are having a great time and the depth of feeling Liverpoolare engendering in those children will never leave them. Future season ticket holders. Future Kop end singers. Guaranteeing another generation of atmosphere at Anfield. Probably to late now mate, but I would have thought some sort of end of season party? Location wise I would guess Glasgow. I like Gerry cinnamon and rangers so win win. It's absolutely brilliant what the Liverpool fans are doing at the moment. Phenomenal songs for the majority of their players creating an unbelievable atmosphere and bond between players & fans. We desperately need more of this. Me too. Had never heard of him until I checked a song I saw in a Boss video, liked it and searched and found it was Belter by Gerry Cinnamon. End of season would be a good idea to start, but would have to be well advertised in plenty of time, maybe advertise it at last home game? I think by doing it during the season you will maybe attract more folk, as it could be timed for after a home game. I would say Glasgow is best bet, taking into account transport links and the amount of support we have in Glasgow and the surrounding areas I would imagine you would have more chance of success there. I am thinking timing may be an issue. I currently have 1 confirmed and 1 likely willing musician. They would have to get up to speed with the song list we want to attempt. Never having done anything remotely like this before, I want to be certain everything is done correctly. I would actually like to set up some sort of web/Facebook page for those likely to be attending this. I watched the Boss documentary last night and it has given me lots of food for thought. Would like to digest it and reflect. There’s a Gers fan on YouTube with a good voice and a guitar called Dean Chalmers. He would be a good fit if interested. If we had that Fan Zone were after we could have a singer singing songs that hopefully spread to the terraces. Anyone with genuine interest in writing songs about the club/players should get together and brainstorm. We’ve not even got an original song for Steven Gerrard, that’s how bad things are! What about pre-season to fit on with a friendly match? Yep, that's my thoughts too. 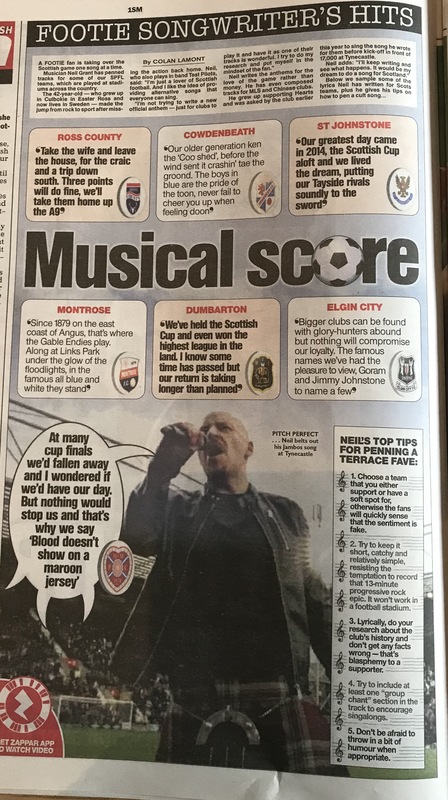 I messaged Dean, I don't hold out much hope for a couple of reasons, his nose may be a wee bit out of joint due to the lack of interest in his Stevie G song and the fact this sort of thing he may feel will affect his professional career. Spoke with Rab who is willing to host it, but for obvious reasons not on a matchday. Nice idea in theory but our support isn’t imaginative enough for this kind of thing. Sad but true. Bufalo song only original one for years. No tune for a stalwart like Tav, none for Steven Gerrard. The old loyalist tunes still rule the roost in our support. Nice idea in theory but our support isn’t imaginative enough for this kind of thing. Sad but true. Bufalo song only original one for years. No tune for a stalwart like Tav, not for Steven Gerrard. That's the spirit! Only need a few creative people to get it going. The rest of our unimaginative support just have to turn up and enjoy themselves. I'm sure we are capable. Think the Loyalist tunes are the easy fall back and probably why theres so few original songs started. Might be the kind of event that could see that change. Can't believe I never thought of a venue that's just been suggested to me The WRC would be perfect. Downstairs has the stage, perfect. Get rid of the tables around dance floor and yer sorted. No offence to The Louden but this would be 10x better.